For over 30 years Peterson Roofing has provided top-notch services to the Quad City area. Over the years we have completed thousands of jobs leaving customers happy and 100% satisfied! During our time we have worked with local building inspectors and home builders that trust us to roof their own homes. From the largest apartment complexes to the smallest home, rest assured we have the ability and the know-how to please the most important customer. YOU! All of our shingles are premium quality and are backed by their reputable manufacturers. Our standard shingles come with a limited lifetime warranty. Designer and metal shingles have a limited lifetime warranty as well. With our wide selection of shingles, you’ll never have a tough time finding a style you love! At Peterson Roofing we offer FREE estimates plus all of our shingles are installed to manufacturer’s specifications and job sites are cleaned daily. The majority of our jobs take roughly 1 – 2 days to complete and our prices are very competitive. Ask around town about our projects, we’ve probably installed a roof for one of your neighbors, friends, or relatives! I fully guarantee all work done by Peterson Roofing Company to be of the highest standards. All new roofs membranes and flashings are guaranteed for a period of ten years to be watertight under normal wear and conditions. If you have concerns about anything beyond the ten year warranty, call us anyway, we’ll be glad to look over your roof. It is our policy to maintain good customer relations at all times! Note: Although It is very rare, it is possible to receive defective materials. Manufacturer’s warranties cover any defects in their products. We will assist you in every way possible to reach a settlement if you should have a claim. 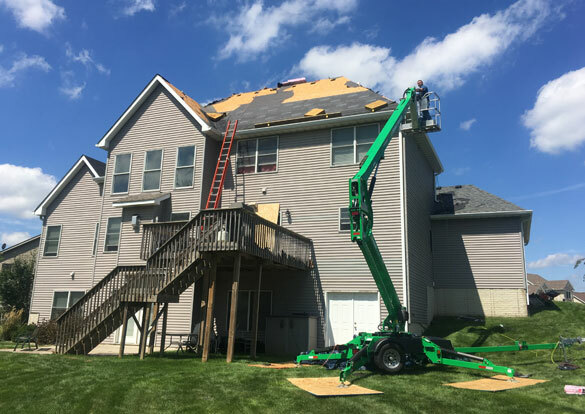 Licensing & Certifications for Jody Peterson Construction Inc.
Peterson Roofing has never been forced to change carriers due to high insurance claims. We carry workman’s compensation, general liability, building and vehicle policies, all with the same company. Workman’s compensation covers the workers in case there is an accident and general liability covers your property. Rest assured that in the unlikely event something should happen, you’re covered. Peterson Roofing accepts Visa, Mastercard and Discover credit cards. Some roofs may be storm damaged by hail, wind, etc. We will work with your insurance company to help settle your claim. We are very experienced in this area and have worked with all insurance companies. If you suspect storm damage, we can help! At Peterson Roofing we are so confident that you will be satisfied with your new roof that we do not require a down payment. The exception is special order non-returnable materials that must be ordered in advance. the final bill for your approval and payment. “Our number one concern is that you have received a quality roof at a fair price.